Today is Halloween, and this year, I actually organised myself for the occasion by making something. My choice of recipe was governed by one ingredient - candy corn. You see, I had a massive bag of candy corn, which I really don't like much, but which I didn't want to waste. Cue a Google search, and I found a recipe for candy corn peanut butter bars that only needs three ingredients, including candy corn. Perfect! 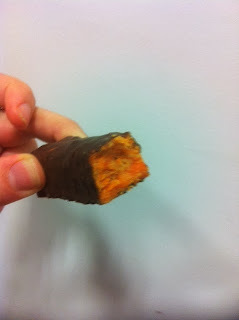 And they really do taste like Butterfingers, as the recipe suggests. To make these is simple - melt three cups of candy corn in the microwave, add 1 1/2 cups peanut butter, mix until blended, spread evenly into a lined 8" square cake tin, score the bar shapes while they are still warm (trust me, you can't cut it once it's set), and wait for it to set. Then separate out the bars along the scores, dip in 200g melted dark chocolate, leave to dry on baking paper (or put in the fridge to set them more firmly), and presto - you have candy corn peanut butter bars. 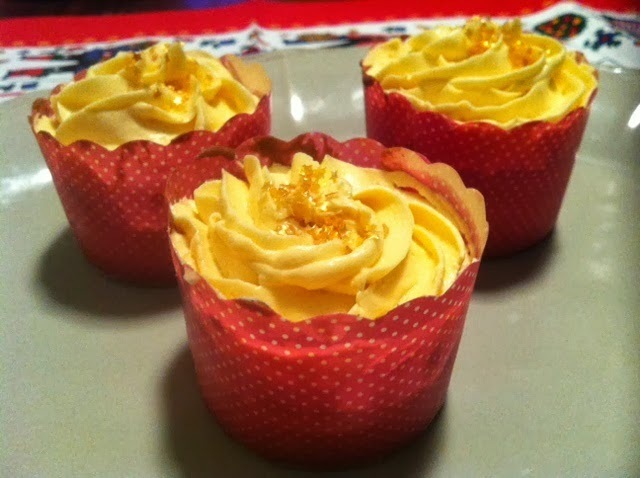 They are perfect for Halloween with their bright orange coloured filling. To those who celebrate it, Happy Halloween! 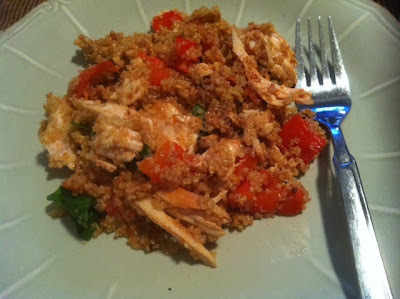 This week's Wednesday with Donna Hay recipe was chosen by Chaya. 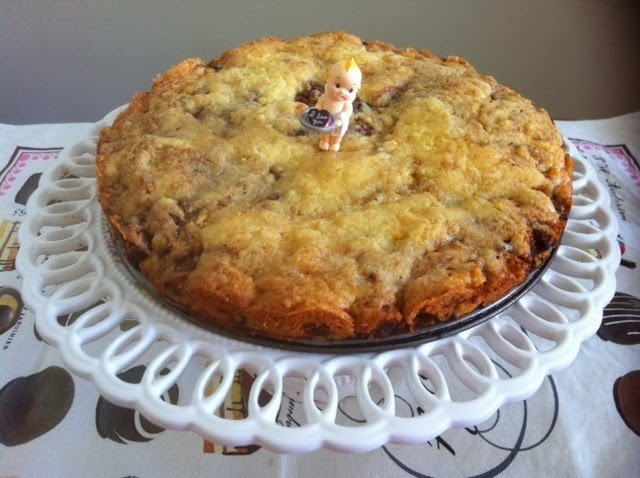 She selected banana hazelnut chocolate bread from Donna's online archives. This bread is really delicious - it is deep and dark and moist, with a satisfying crunch from the hazelnuts. I used as much banana mash as I could get from 2 bananas (which wasn't quite 2 cups) and I subbed dark chocolate for milk chocolate, and everything was fine. I really liked this and would make it again. To see what Chaya, Kayte, Margaret and Sarah thought, visit their websites. It was Tim's birthday last week. As he likes spicy and Asian food, I thought where better to take him for his birthday dinner than Spice Temple Melbourne. This restaurant is the Melbourne offshoot of Neil Perry's Sydney establishment of the same name, and focuses on Cantonese food. I have a copy of Neil Perry's beautiful book on Asian cooking, Balance and Harmony, so I was keenly anticipating our meal at Spice Temple. This is a crisp sparkling and was a good way to start our dining experience. We decided to order the $95 banquet, because it gave us a chance to try a little of lots of things and was good value when you looked at the main menu price to buy the dishes individually, and it sounded more appealing than the $75 banquet menu. The flavours were so refreshing - the chilli (which is in basically everything at Spice Temple), coriander and lime particularly stood out. The pork belly was soft and melt in your mouth. It was accompanied by a chilli paste, and the pancake actually needed a smear of the chilli paste to lift the flavours and make it special. However, I can guarantee you that it was in fact fried squid with whole five spice and dark chilli paste from the $75 menu. Not that I minded - I think I actually liked this better (I adore calamari), and it was one of my favourite dishes. This dish was quite a contrast to the other dishes in that it had minimal chilli, and tasted quite cool and refreshing. Tim had a bottle of Lord Nelson brew (made by a Sydney hotel where we have stayed) instead. The brisket melted in the mouth; however, this was quite a rich dish, not a quality that you ordinarily associate with stir fry. This dish was just so good, with the pork being a subtle second player to the star, the corn. I found this to be identifiably hot, but Tim didn't find it to be so. It is in red on the menu, so my feeling was right. This dish was OK, but not as good as some of the other dishes. There was a bowl of steamed rice served with the mains. I am a dessert lover, and this pudding was sublime. Despite the mango and condensed milk, it was not overly sweet, and it was as smooth as silk and melted on the tongue. Heavenly! The banquet was just the right amount of food - I was not rolling in the aisle, nor was I left hungry. The staff at Spice Temple were friendly and attentive, and did a great job of rotating around a number of very busy tables. Our water glasses were frequently refilled - which is very important at a restaurant where nearly every dish contains chilli! We even did a spot of "celebrity" spotting, with Martin King from A Current Affair being on one of the corner tables. I highly recommend Spice Temple for diverse, beautifully tasting food with a spicy accent. On Wednesday, it was Tim's birthday. Tim loves white chocolate, so I wanted to make him a birthday treat containing white chocolate, but which was not too time consuming to make and was portable. 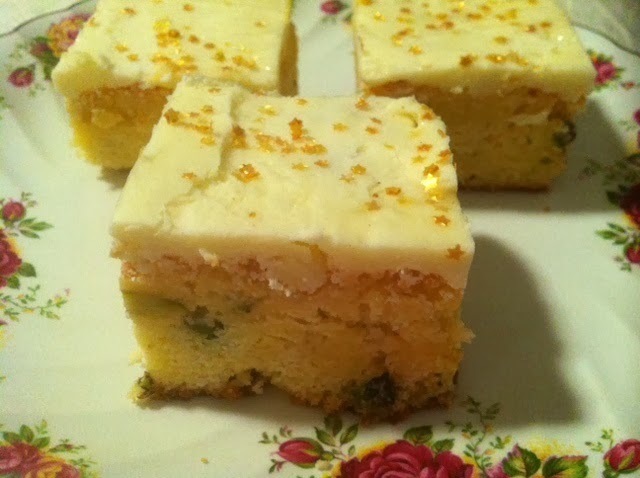 I selected Allyson Gofton's white chocolate brownies from her book, Bake. She has also published the recipe for the brownies and the white chocolate icing on her website. These brownies contain white chocolate and pistachios. I sprinkled my brownies with gold stars instead of extra pistachios, which I thought was more festive and fitting for a birthday. In the interests of research and review only (so I tell myself), I cut a couple of slivers off the brownies to taste. These brownies are dense and sweet, as you can imagine from the amount of white chocolate in them, and the pistachios add a lovely crunch. The white chocolate icing is not strictly necessary, but adds another element of sweetness to the brownies. It's French Friday with Dorie time again, and this week's recipe is Muenster cheese soufflé. Now, to make a Muenster cheese soufflé, I figure you must use Muenster cheese - am I right? Umm, unfortunately, I didn't have Muenster cheese, so I used Devondale Light Cheddar Cheese. Hey, it's cheese! I divided the recipe into a quarter so I could make one serve - as the proportions of ingredients are in odd volume measures, this was no mean feat. (Thanks to Kayte for my teeny tiny Oxo measuring cup.) Apart from my cheese choice, I also lightened this up by using margarine instead of butter, and using skim milk. I further thumbed my nose at the recipe by using black pepper - who needs two kinds of pepper in the house? And you know what? This was delish. I served it for breakfast with a handful of baby spinach leaves (not pictured), and it was really good. The only hard part was waiting for 25 minutes for the soufflé to cook. It is Dorie Greenspan's birthday today, so our French Fridays with Dorie group is celebrating by each making a recipe from one of Dorie's books. Hooray! Yup, a smashed mess. However, you have no idea how good this smashed mess tasted - I momentarily thought about tossing the thing out and forgetting it ever happened, but once you taste rum-soaked raisins with ooey gooey chocolate ganache and a buttery tart shell, you can't go back. It tasted devine. You cannot throw it out - it would be sacrilege. This passed the "will I eat it?" test at work, as it all disappeared. 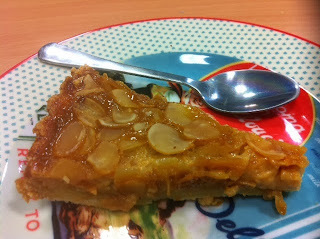 Alas, I know that it did not taste as good as the tart, which I will make again for a special occasion - it was that good. 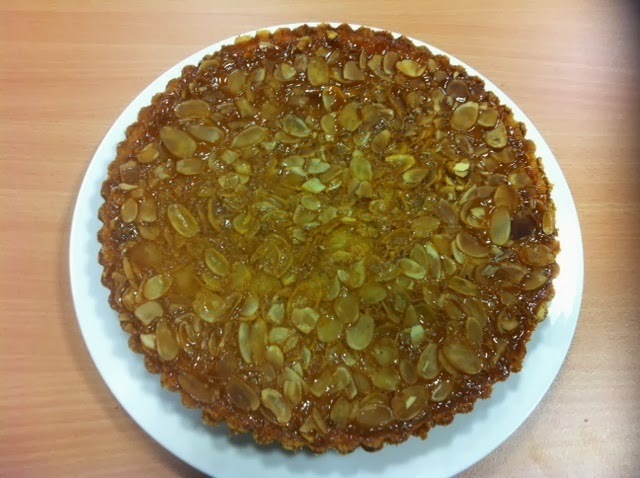 To make the tart (and I highly recommend that you do), you can find the recipe for the filling online here. For the tart shell, I just used Dorie's dream sweet tart dough (the book recipe makes too much dough, so I used the recipe out of From Around My French Table which cuts it down to one tart shell). You can get that recipe online from Dorie herself here. It is a no shrink, no roll recipe - just blitz it in the food processor and press it into the pan. 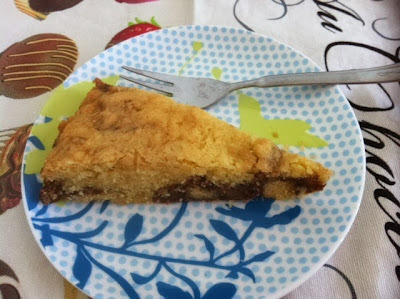 If you want to make the Perfection Pound Cake on its own rather than to glue together a shattered tart, you can find the recipe here. I used a half recipe to bind my tart together. This week's Wednesday with Donna Hay recipe was chosen by Margaret. She selected Donna's Chicken and Roasted Capsicum Pasta. The only part about this recipe that I didn't like was peeling the skin off the roast capsicums - never an easy job, and it takes forever. I used quinoa instead of pasta in keeping with my diet, and used balsamic vinegar instead of malt vinegar for the dressing. The resulting dish was delicious, and I would make it again - with pasta. Unfortunately, I have a quinoa sensitivity (nothing to do with washing the quinoa - I first suspected there was an issue when I was only eating the very processed quinoa flakes), which makes my gut burn for a couple of hours after eating quinoa. Very sadly, I had to toss the the leftovers from this dish, but if you don't have a quinoa sensitivity, the quinoa makes a very serviceable alternative to the pasta. The lyrics above apply to the relationship between caramel and almond - so happy together. They also describe the relationship between me and Dorie Greenspan's Caramel Almond Tart, the subject of this week's French Friday with Dorie - so happy together. This tart is absolutely delicious, yet so simple to make. It starts with Dorie's magical sweet tart dough that you press into the pan rather than rolling it out, and which doesn't shrink. In short, it's a dream! Next, you make a caramel cream. I was little surprised when I made this, as I was expecting caramel - but of course, once you add a large amount of cream to a small amount of caramel, you get caramel cream, which is quite fluid, rather than a viscous caramel. 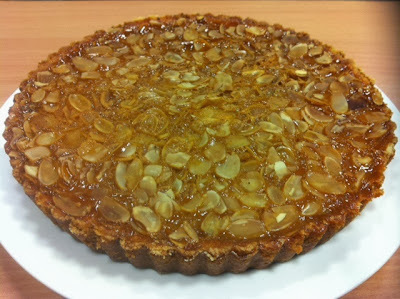 To see what the other Doristas thought of this tart, visit the LYL section of the website. 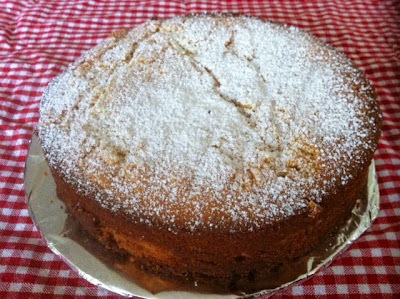 Regular readers will know that (a) cakes are my favourite thing to make; and (b) I cannot resist the unusual in a recipe. These traits recently brought me face to face with the Lemon Potato Cake, which contains mashed potato. How weird is that? 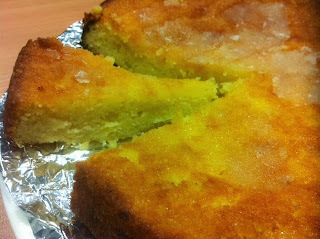 I first saw a lemon potato cake on someone's blog, then couldn't find that recipe when I went to make the cake. Accoridngly, I made Tim's Lemon Trickle Mash Cake via River Cottage instead. The recipe is online here. I have no idea who Tim is, or why the cake is a trickle cake, but I'll put the latter down to the charming way that the English have with language - read the chapter on place names and the glossary in Bill Bryson's Notes from a Small Island to get the gist of what I mean. 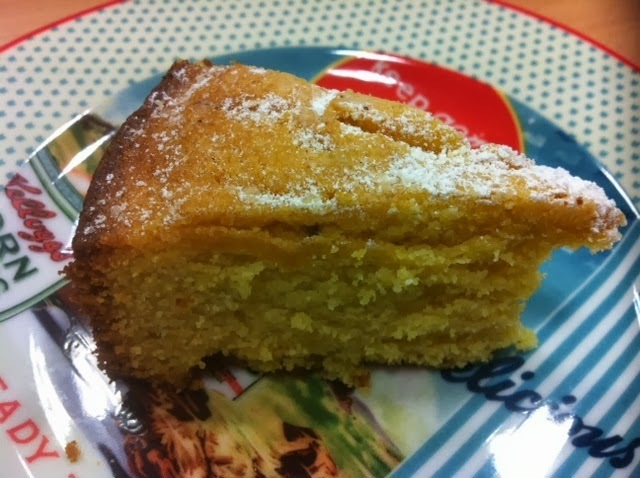 I heeded the warning in the recipe and made up potato mash especially for this cake, and didn't add anything to the mash (except salt to the cooking water). This is so that no foreign savoury flavours find their way into your cake. 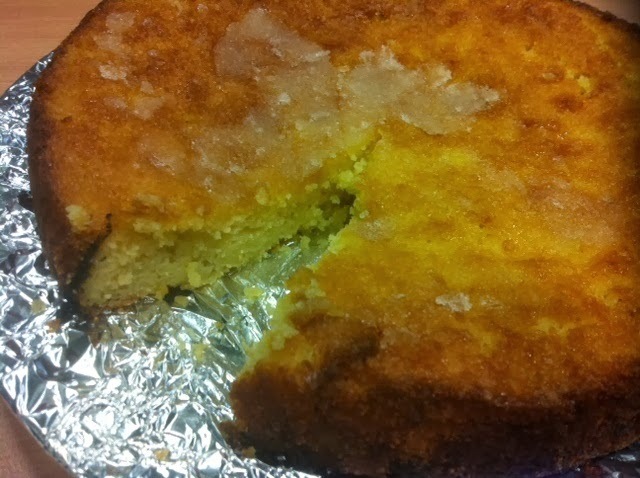 It's a little like lemon delicious in cake form, and you'd never know there were mashed potatoes in there. Curiosity satiated, I really liked this cake. Serve it on its own, or with e little warm custard - mmmm. Today's Wednesday with Donna Hay pick is Garlic Chickpeas with Cumin Fried Fish, chosen by Kayte. It comes from Off the Shelf. You can also find the recipe here. Despite my fish collapsing under the pressure when I tried to plate it, this was a very tasty meal. The chickpeas, cooked with leeks and lemon zest, were a delicious side to the spicy fish, shallow fried with cumin and chilli. I ate my fish with stir fried vegetables (of course). I think the chickpeas would go perfectly with any number of things, and I would definitely make them again. To see what Kayte, Margaret, Chaya and Sarah thought of this dish, visit their sites. I have seen lots and lots of chocolate and avocado cakes on the Web, and I really wanted to know what they tasted like. Trouble is, I don't buy many avocados as avocado in vast quantities makes me gag in its richness. However, I finally got the chance to make a chocolate and avocado cake after I bought two avocados with the best intentions of having avocado and poached eggs for breakfast, then having it once and deciding it was not for me, and the avocados being already quite ripe. 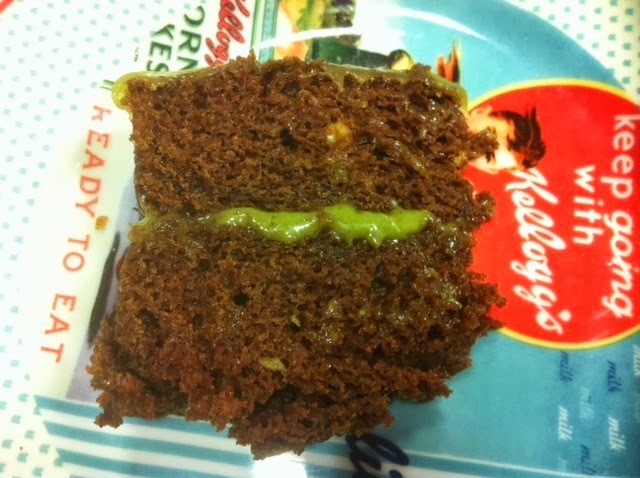 Hooray - a grand opening for making a chocolate and avocado cake was created. 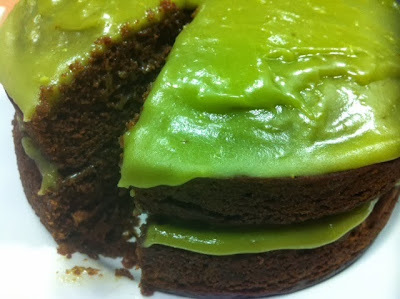 There are heaps of recipes for chocolate and avocado cake out there, but I chose Lorraine's Chocolate and Avocado Cake with Avocado Buttercream because it is also vegan. I am not vegan (as you can tell from the last few posts), but as everyone runs out of eggs from time to time, it is essential to have a good egg-free cake up your sleeve. I was worried that the cake and/or the frosting would taste horribly like avocado - but it didn't. It was also a terrific way to use up a couple of avocados. The cake is chocolatey, but as there is no actual chocolate in the cake, it is not going to usurp my favourite chocolate mud cake recipe, but as an alternative when you have avocados and need something a little lighter, it will do quite nicely. Don't be alarmed by the glow-in-the-dark green frosting - although I got lots of comments about "green slime", it tastes just like any icing, and has a natural green colour to boot. Next time you have some avocados on the turn and don't want to waste them, give this cake a try - you may be pleasantly surprised. A couple of weeks ago, I held a dinner party for some close friends at my house. I have belatedly discovered that my slow cooker is the hostess's friend, as you can get on with doing a myriad of other tasks while dinner looks after itself in the slow cooker. To take advantage of my slow cooker, I decided to make Lamb Shanks with Cannellini Beans in the slow cooker. I accompanied them with a pumpkin, cranberry and quinoa salad, for which you can find the recipe here, broccolini poached in chicken stock with garlic, the recipe for which can be found online here. The recipe for the Lamb Shanks with Cannellini Beans came form one of my newer recipe books, Slow Cooking by Catherine Atkinson (p118). The sauce is white wine based rather than being based on red wine or tomatoes, but is equally delicious in a different way. My guests enjoyed lamb shanks cooked this way, and what is even better, once the initial prep is done, you can leave these shanks to cook away while you get on with other things for your guests. Season the lamb shanks with salt and pepper then coat them in the flour. Heat the oil in a large fry pan and brown the shanks in the pan until browned on all sides. Transfer the shanks to your slow cooker. Add the onion to the pan and cook until golden, then stir in the garlic, celery, carrot, rosemary and bay leaves. Pour in the wine and allow it to bubble and reduce, then add the tomato paste diluted in the hot water. Bring the micture to the boil, season with salt and pepper, then pour it over the lamb shanks in the slow cooker. Cook the shanks on high for 4-5 hours, stirring occasionally. Taste for seasoning before serving. This week's French Friday with Dorie dinner is Boeuf a la Mode. What does that mean? I have no idea. 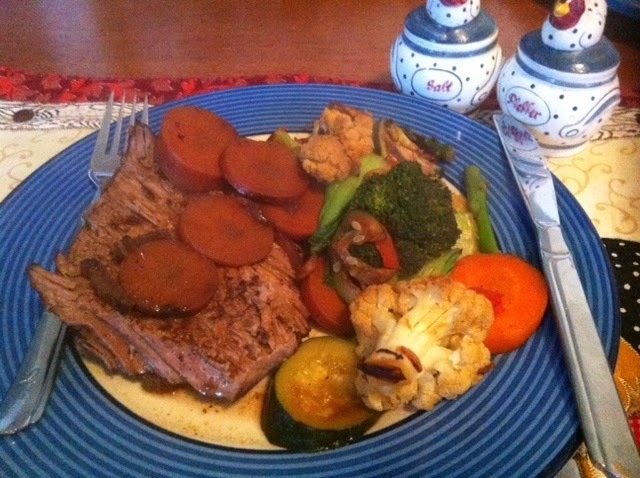 However, broken down into main components, it is roast beef and vegetables in a red wine-based sauce. I served mine with stir fry veg - yes, I know that's a little weird, but it fits in with my current dietary circumstances better than mashed potato and pumpkin. I found this dish a bit of a pain to prepare, because you have to marinate the beef and veges for 12 hours first, then you have to render the sauce, brown the beef, soften the veg, combine with sauce and brandy, and only then can you cook it - for 3 hours. It is an all weekend job. I was also going out on the day after the marination so a 3 hour babysitting session with the beef was not happening. Instead, I stuck it all in the slow cooker on low for 5 hours - which was probably around an hour too long, but it did the job. This meal was OK, but not worth the cost in terms of my ultimate enjoyment of it. My favourite part was the marinated veg. To see what the other Doristas thought, visit the LYL section of the FFWD website. Good morning to all! This is a short and sweet Thursday treatie post for those who love cheesecake but hate the calories associated with it. 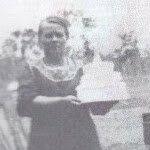 I found a new blog, Sally's Baking Addiction, through a Google search for yoghurt frosting, and found a treasure trove of delights. I was particularly captivated by her "skinny" recipe for Raspberry Swirl Cheesecake Bars, which you can find here. 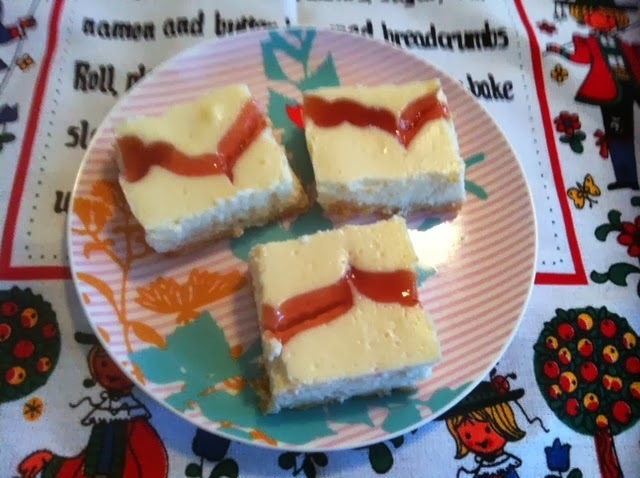 After finding this, all thoughts of yoghurt frosting were abandoned in favour of these light, yet creamy and delicious cheesecake bars, for which I happened to have all of the ingredients. Light cream cheese, Greek yoghurt, egg whites and a swirl of jam of your choice make for one tasty but guilt-free cheesecake hit! I used strawberry jam instead of raspberry jam, as that is what I had on hand, but otherwise followed the recipe. 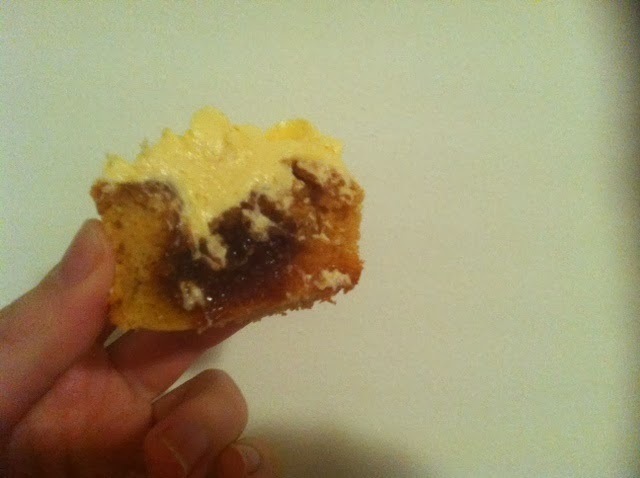 I warmed and strained my jam before piping it on in straight lines using a paper piping bag, then runing a skewer through the jam to get the "swirl". These bars are so good that you would never guess they are not made using their full fat recipe cousin. If you are a cheesecake fan - go make these! This week's Wednesday with Donna Hay pick is Lemon, Lentil and Yoghurt Soup, chosen by yours truly, from p16 of Modern Classics I. 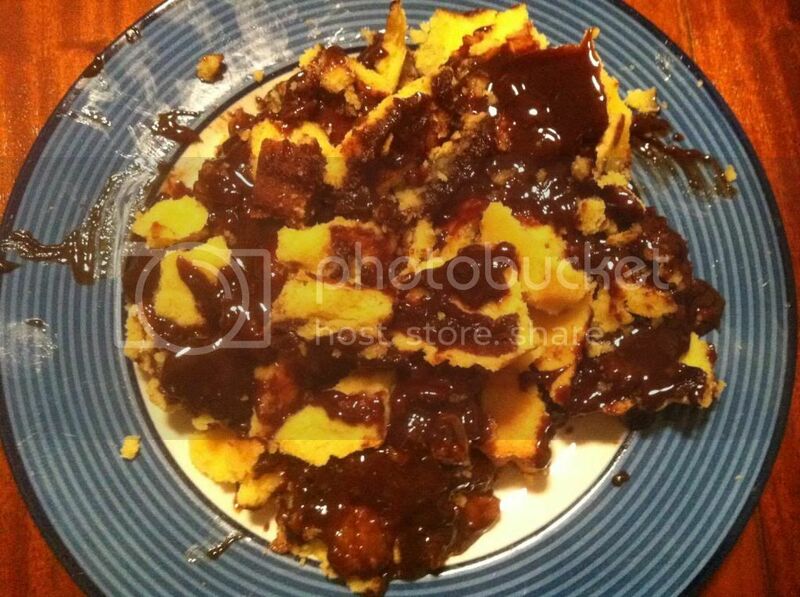 The recipe has also been posted online by a Donna Hay fan here. When I picked this, I wasn't sure I'd even like it - I had some lentils (albeit brown, not red, as called for by the recipe), so this seemed like a logical choice to use them in. I included baby spinach rather than English spinach and I added the yoghurt garnish (because I already had some yoghurt), but I skipped the coriander as I was out of that. The end result pleasantly surprised me - the soup is lightly spiced, textural from the lentils, and with a winning flavour coming from the lemon zest, which made the soup for me. It took the soup out of pea and ham territory into something much lighter and breezier. To see what Kayte, Margaret, Chaya and Sarah thought of this dish, visit their websites (tomorrow Oz time). Recently, I acquired a copy of Love Bake Nourish by New Zealand baker Amber Rose. The pictures in the book are swoon-worthy, and I like the fact that she uses alternative flours, including spelt, polenta and nut meals. I wanted to whip up something quick to take to work this week, so I chose Amber's Lemon, Lavender and Honey Cake. The recipe is online here. This is one delicious cake, and I am looking forward to trying some more of Amber's creations in the near future. On Wednesday, it was my friend Steve's birthday. I like to make him cake every year, and this year, instead of one large cake, I made cupcakes. I have the Sprinkle Bakes cookbook, and used it for the first time to make Steve these Triple Salted Caramel Cupcakes. You can find the recipe online here, but the book is a good one if you want to invest, as it shows you how to make the mundane quite stunning. I didn't make the halos - they look fairly easy, but when you are baking at night after work and trying to watch TV and get ready for bed, you need to draw the line somewhere. I just used sparkly gold stars instead. 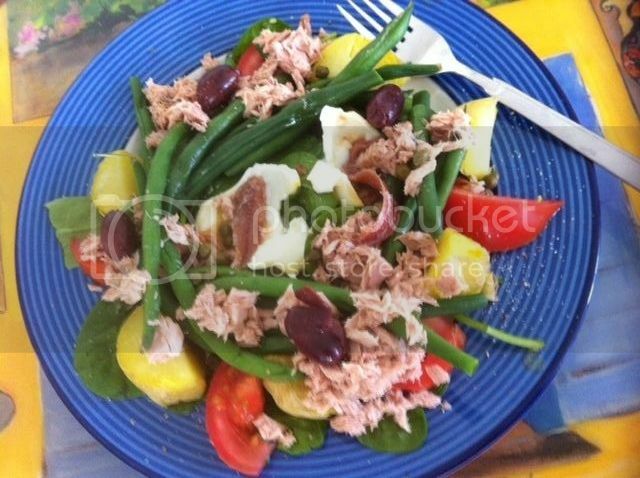 It's Friday again, and for French Fridays with Dorie this week, our dish is a French classic - Salad Nicoise. I only recently learned how to pronounce this, so it won't surprise you that I have never eaten this salad before now. As you can see, it is quite a substantial salad and takes quite a bit of preparation. My egg is not very visible because I undercooked it and most of the yolk leaked out - but it's there, I promise you. I really enjoyed this for lunch last Saturday - it is the kind of thing I would make again, especially when this non-salad girl is looking for a salad to make in the warmer months. To see what the other Doristas thought of this salad, visit the LYL section of the FFWD website. This week's Wednesday with Donna Hay recipe is Grilled Asparagus with Balsamic Butter, chosen by Sarah. 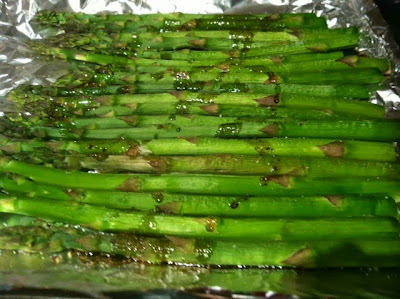 There is not much to this - just grill your asparagus, then top it with 40g or so of butter that has been melted and mixed with a tablespoon of balsamic vinegar. Simple, quick and tasty - therefore it's a winner!